The maned wolf is the largest canine species in South America and closely resembles a red fox on stilts because of its long legs. It is neither a wolf or a fox, but rather a member of its own genus. 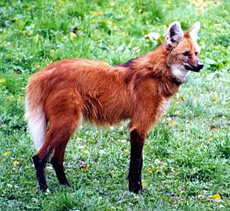 Adults stand about three feet tall at the shoulder and weigh about 50 lb, and their coats are long and golden red in color. Their ears are large and about seven inches long, and the shoulders are covered with black hair, giving them a wolf-life appearance. 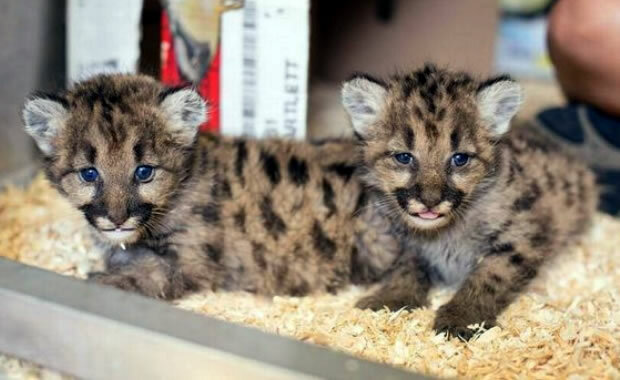 They also possess a mane that runs from the back of the head to the shoulders which can be erected to intimidate other animals when displaying aggression or when they feel threatened. The preferred habitat for the mane wolf is tall, open grasslands on the edges of forests, or in savannas or marshlands. Maned wolves are omnivorous, feeding on a variety of foods such as small rodents, armadillos, birds, fish, insects, and reptiles. They will also feed on dead animals and fruit, and they are known to sometimes steal and eat chickens from farmers. Prey is caught by stalking and then pouncing on it similar to a fox. Hunting is done mainly at night, and much of the day is spent resting under thick bush cover. Maned wolves do not form or hunt in packs but prefer to live alone. Males and females seem to have very little contact except during mating season. Mating occurs from November to February, and females give birth to two to six pups after a gestation period of 50 to 75 days. This species is threatened by hunting (both for sport and for the medicinal value of some of its body parts) and also habitat loss. Maned wolves need wide and uninterrupted space, and sometimes the clearing of forests benefit them greatly, but these grasslands are said to be burnt yearly. The National Zoo is working to protect maned wolves, and some of their efforts include protection of their habitat, continuous study of the species in the wild, and the education of locals. Maned wolves are legally protected in Brazil, although some poaching still occurs. Copyright Notice: This article is licensed under the GNU Free Documentation License. It uses material from the Wikipedia article "Maned wolf". Glenn, C. R. 2006. "Earth's Endangered Creatures - Maned Wolf Facts" (Online). Accessed 4/20/2019 at http://earthsendangered.com/profile.asp?sp=510&ID=11. Need more Maned Wolf facts?